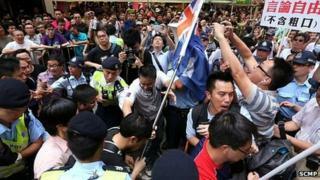 A three-week old row between a teacher and Hong Kong police sparked mass protests and scuffles after footage of the dispute was posted on YouTube, it's reported. On July 14, primary school teacher Alpais Lam Wai-sze was filmed complaining about a police cordon, swearing and jabbing her finger at officers, reports the South China Morning Post. Mobile phone footage of the incident quickly went viral and while Ms Lam refused to apologize to police, she reportedly said sorry to her school for any embarrassment. But last week a longer version of the clip emerged, showing officers had been policing rival protests by the Youth Care Association - widely seen as supporting Beijing's Communist authorities - and the Falun Gong spiritual movement, which is illegal in China but tolerated in Hong Kong. In the context, it became clear that Ms Lam - whose father is a pro-democracy activist - was not protesting at her own lack of access, but rather accusing the police of favouring the pro-Beijing group. A "confrontation between pro-Beijing and pro-democracy camps" brought nearly 3,000 people onto the streets at the weekend, when things briefly degenerated into a brawl, reports the Post.